I'm going to be removing the oil pump and just running my 75 rd125B on 32:1 premix and I was just wondering about what size main jets I should use? I just rebuilt the carbs with a kit that came with #66 main jets, but after looking in my manual it calls for a 94 main jet so I'll be reinstalling the original jets before I start fine tuning it. I've heard when converting to premix you should go up in size about 10-20%, is that about right? As per various posts on here and other forums, be very wary of using any jets that come with kits. Jets from the original manufacturer are generally still available and it is best to use these. I am curious to know where you got your data from as to fit 66 main jet as Yamaha manual says 94 for this model, I am not arguing just curious to know. I tried running the bike with the 66 jets and from idle to about 1/4 throttle it was fine but that’s not really using the main jets. Give it more than 1/4 throttle and it cuts out like it’s starving for fuel so I put the original jets back in. Turns out the originals are 94’s, it’s just really hard to see the numbers on them. With the bigger jets back in I could tell it was running better. Not perfect though because it still seems like it’s not getting enough fuel at higher throttle settings so I definitely will get some bigger size jets. 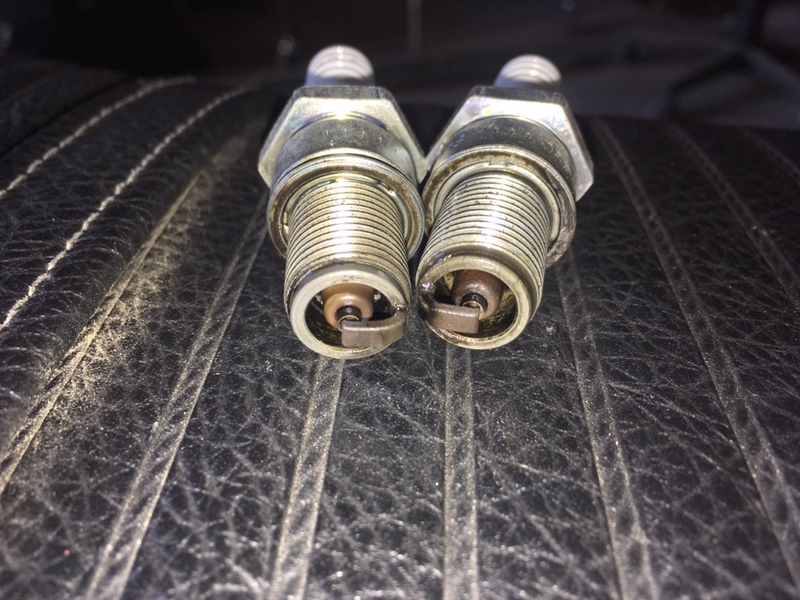 Here’s some pics of the plugs, I think they look about the same but I didn’t really run the bike for that long each time. 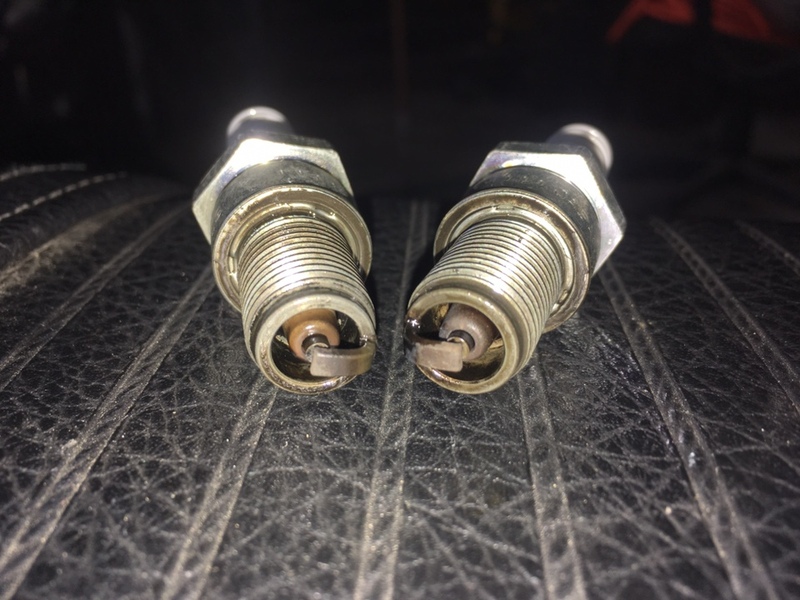 The first pic is the 66 jets, second is the 94’s and the plug from left cylinder is on the left in both pics and right plug on the right. Also they were pretty wet when I pulled them out, is that normal or am I possibly giving it too much fuel somehow? Are you using standard airbox and filter, what notch are the needles on and how many turns out are the air screws set at. Refer back to manual as to which notch for needles and air screw turns out. Your looking for a nice brick brown colour. Here is a chart of plug colours for you. I took it for a couple more rides with different carb settings and I feel like I’m getting closer. It seems like after about 1/4 throttle the engine would stumble and kind of surge power. Did some research and I guess that means it’s a little too rich. That was with the air screw 2 1/2 turns out, 94 main jet, and the needle clip on the second highest position, that’s all the stock settings from the manual. So since I thought it was rich I raised the needle clip to the top spot and it seemed to help, but it still was stumbling a bit. So I figured I’d put the 66 main back in to really lean it out. With that setup it was definitely too lean, at higher throttle settings the engine would just lose power and start to stall like it was starving for fuel. Good! you seem to be getting somewhere now, please keep us informed of the progress. Just drained the tank and filled it up with some fresh properly mixed 32:1. It ran a little better all the way up to about 1/2 or 3/4 throttle then it still bogs and stumbles a bit around full throttle. Also the plugs were pretty black. So looks like the 94 main jets are definitely too rich. Going to get some jets ordered and I’ll let you guys know once I get it figured out! You need to connect the air filter up or if you do get it running nice and then connect it up it will make it richer, you can warm the connectors up and that will make them more pliable, hair dryer or heat gun on low will do it.